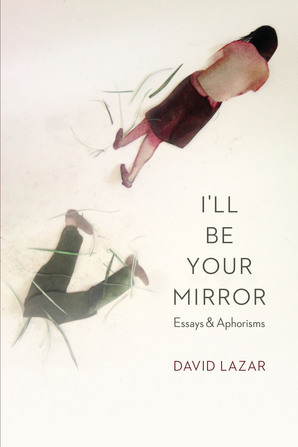 David Lazar’s new collection of essays and aphorisms, I’ll Be Your Mirror is, in fact, all about mirroring. Mirroring each other. Mirroring parents. Mirroring loved ones. Mirroring readers. Mirroring writers. Mirroring ourselves. It has a kind of Lacanian mirror-stage complex, this book, concerned as it is with how we find our identity in the eyes and desire of another. And at the same time, it’s about how utterly, completely alone we are—and the solace to be found in that aloneness. As someone whose only real social life is reading books, like Lazar’s, I loved spending time with him while reading this collection. It felt like hanging out with a dear friend—a friend who hums to himself, often digresses, and occasionally shouts frenetic revelations into the early-morning insomniac darkness, but dear nonetheless. The collection’s first essay, “Ann; Death and the Maiden,” is about an ex-girlfriend’s suicide, and the ways that the essayist-narrator Lazar—who, as these essays demonstrate, might or might not be the “real” Lazar—is learning to come to terms with it. This suicide is threaded throughout the book, and it could arguably be seen as the book’s primary, though not always explicit, focus. I was a young professor, thirty-seven, and she was an older doctoral student, thirty-four, and we had fallen for each other, and I thought it was going to be a big deal, in the way you know that someone is going to come into your life and the tectonics are going to change. We learn, quickly, that she commits suicide a year and a half before this essay’s writing, so we know this is not going to be a story with anything like a happy ending. It doesn’t even have a particularly happy beginning or middle, what with the wild drinking and parties and cruelty rivaling Who’s Afraid of Virginia Woolf that we hear about in this essay and others. The maiden, we learn, is bipolar and only sometimes medicated. We also learn that there is a hopeless, desperate love between her and our essayist—a love that’s long unraveled but is still there, in some way, even after her death. It’s a fitting way to begin this collection, since it’s an essay, at least in part, about the ways relationships serve as a mirror for both our best and worst selves, our capacity for infinite compassion and our endlessly strangling neuroses. And as the essayist Lazar delves into questions surrounding this particular relationship, he uncovers similar questions about our relationships with all manner of others—mothers and friends, celebrities and fans, texts and readers. So, reader. Reader. Darling reader. There’s something I want to tell you. It’s a story, but it’s more than a story. It’s what I think about what’s happened to me. To us. And where I might be headed. We might be headed. It involves movies, books, walking around if it’s not miserably cold, and your occasional willingness to laugh at my jokes. Together, we might be able to cobble together an essay. It’s an essay about assaying, about trying to make a connection with a reader, and about the way that an essay is only complete when someone reads it. From a defense of bowling alone to an analysis of going through Pandora’s boxes full of old photos, from a dialectical essay in the form of an interview between Lazar and Mary Cappello to a collection of aphorisms about mythical mothers accompanied by eerie, haunting illustrations by Heather Frise, I’ll Be Your Mirror is a wild and strangely endearing ride through Lazar’s life, mind, and relationships. Endearing, perhaps, because we understand that the theoretical bravado and accounts of emotional pyrotechnics are, in the end, engaging but necessarily imperfect reflections of a caring son, a kind father, and a brilliant introvert who likes to walk through cities making up songs. Vivian Wagner lives in New Concord, Ohio, where she teaches English at Muskingum University. She’s the author of a memoir, Fiddle: One Woman, Four Strings, and 8,000 Miles of Music; a poetry collection, The Village; and a micro-chapbook, Making. Love the review, now on to the book!